CAPS member, Paul-André Lawrie, presented a chronological history of the organette. 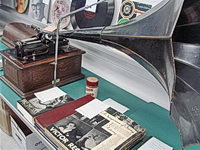 With a spectacular display of more than two dozen of these rare instruments and related items, Paul took us through a history that started in North America about 1877 and ended in the early 1900s when the player piano and the record player industry began to take over in home entertainment. • A "United Talking Machine Co." 10-inch 78 RPM record, in excellent condition, with a large spindle hole made to fit a specific record player. Asking $10.00. • Six assorted Blue Amberol cylinders in boxes, no tops: $12.00. 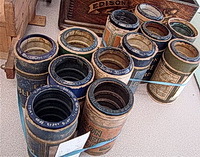 • Another assortment of Blue Amberol cylinders in boxes and no tops. $16.00. • An empty Edison Standard case in "green oak" finish: $25.00. • Six Ruth Wallis 10-inch 78 RPM records (with "naughty" content), in sleeves: $12.00. • A five LP record set, "Bruce Springsteen Live: 1975-1985", in mint condition. Asking $20.00. • A softcover book, "Edison Disc Artists & Records 1910-1929": $10.00. • Two needle tins, a "Best" and an "HMV yellow", with some needles. Asking $30.00. • Two more needle tins, a "Sphinx" and an "HMV green": $20.00. • Three albums of 78 RPM jazz rec-ords: $18.00. 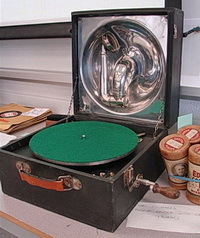 • A 10-inch single-sided Victor record, "Speech on the Navy", recorded in 1923 by Honourable Arth. Lee, the then First Lord of the Admiralty: $10.00. • The feature of the day! A beautiful Edison Triumph with 2- and 4-minute gearing and a shaver attachment, also with a separate recording horn and a package of recording needles in the original box. In excellent cosmetic and playing condition. The horn crane is a reproduction: A "steal" at $850.00! 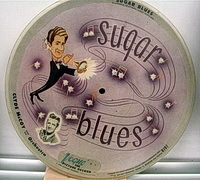 • Vogue picture record #707, side 1 "Sugar Blues, side 2 "Basin Street Blues". Asking $35.00. • A wooden tracker-bar and a valve case for an organette: $10.00. • A battery-operated wall clock with the picture of "Nipper", the Victor trade mark, on the face. Asking $12.00. • Three albums of 12-inch 78 RPM jazz rec-ords: $5.00. • Three needle tins with needles: $55.00. Our guest speaker, John Gergesha gave a very interesting and entertaining presentation titled, "What Were They Thinking?" Using sound clips and photos, John displayed some of the worst recordings ever made - most deliberately so. Also, for the first time twin screens were used simultaneously to project the Powerpoint presentation, so every one in our wide meeting room had a front seat! • A book, "The Complete 78 RPM Record Dating Guide" by Steve Barr: $7.00. • Four black wax 2-min. cylinders in original boxes with tops: $10.00. • A Decca "Dulcephone" (1926) portable record player in black simulated leather case in excellent cosmetic and playing condition: $250.00. • An Edison Menlo Park special edition U.S. stamp: $5.00. • A round (cylindrical) record cleaning brush: $20.00. • A Victor Victrola VV-IV table-model gramophone: $90.00. • A Vogue picture record # 714: side 1 - "Double Doo Doo", side 2 - "All I Do is Wantcha": $35.00. 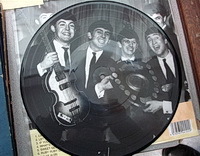 • A 10-inch LP picture record, "Savage Young Beatles": $35.00. 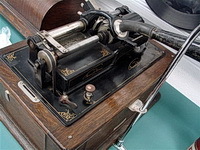 • An Edison Gem phonograph with a 4-min. reproducer. The carrying handle is missing from the top and the horn and crane are reproductions, otherwise this attractive machine is mostly original: $425.00. • Three W.C. Fields records: $28.00. • Three Al Jolson albums with records: $30.00. • Five Little Wonder records: $10.00. • A 33 1/3 RPM record in sleeve, "Pop Dance Obscurities": $28.00. 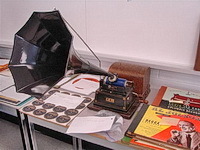 • A Model F Edison Triumph phonograph with a Model "O" 2- and 4-minute reproducer and a No. 11 Cygnet horn. The top lid is missing: $1200.00. 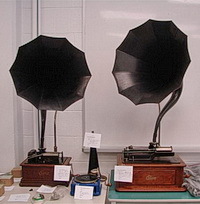 • A Model F Edison Standard phonograph with a Model "H" 4-minute reproducer and a No. 10 Cygnet horn. The horn spring is a reproduction and the top lid is missing: $750.00. • A toy record player in a blue metal case and with a Little Wonder record. Plays well: $160.00. • A 14-inch "Witches Hat" reproduction horn: $60.00. • A 2- and 4-minute Model "K" reproducer: $200.00. • A 2-minute Model "C" reproducer: $110.00. • A 2- and 4-minute Model "O" reproducer: $410.00. • A reproduction elbow for a Victor III: $65.00. • A Jeff Healey pin: $16.00.